All raincoat measurements are taken with the coat flat. Please see photo for measurement guide. Mycra Pac Size Chart is designed to assist you in picking the coat size that is right for you. The measurement guide is a measurement of the raincoat itself. Please refer to the raincoat images below when choosing your size. Mycra Pac Raincoats are swing style rain coats. The travel rain coat is fitted through the shoulders and is generously cut through the waist and hip area making it the perfect fashion rain coat to wear over dresses, skirts and over layers of clothes. When choosing your size keep in mind that Mycra Pac Raincoats are generously cut. European conversion size chart is a printable size chart for traveling to Europe. Conversions are approximate and should be used as a general guide. Fits may vary by personal preference, clothing brands and body types. 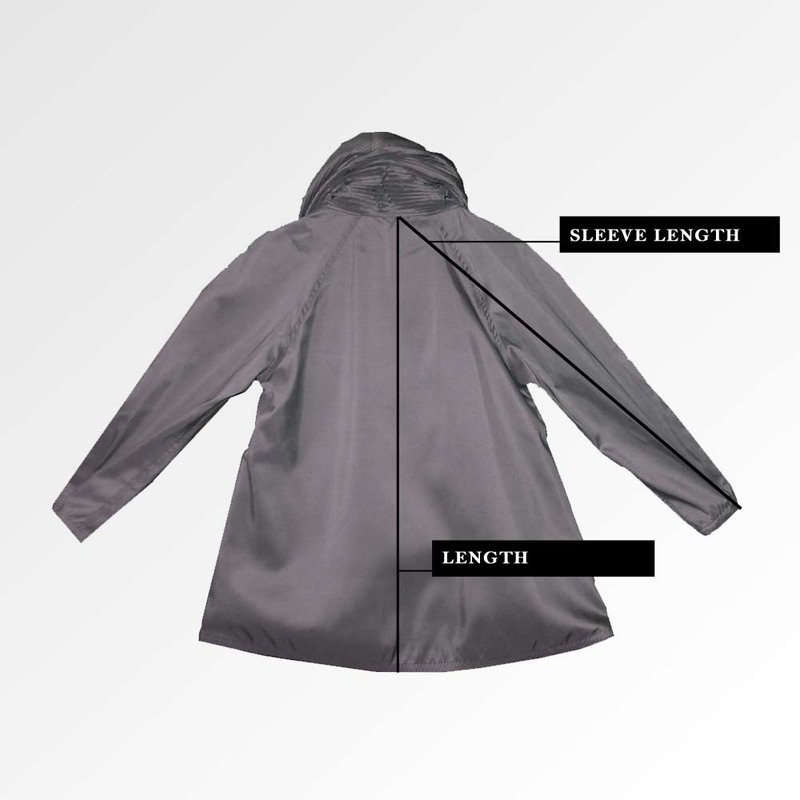 When selecting your Mycra Pac Raincoat please take into consideration the coat’s measurements. Mycra Pac Raincoat Measurements - These are the measurements of the raincoat itself. Use this chart as a sizing guide. You can take a well fitting coat that you already own and measure it to compare sizing. This coat is a swing style and is designed to fit generously over the waist and swing out at the hips. This is so you can layer the coat over dresses and layers of warm clothing. Raincoat measurements are taken with the coat flat out on a table. To see how measurements are taken please refer to photo. Measurements are of the raincoat itself. The Stadium Raincoat is cut straight up and down and does not offer as much room in the waist and hips as the Donatella Style Raincoats. The chest measures approximately the same as the waist and hips in making the Stadium jacket a column style raincoat.